This chapter presents a case study of national identity conceptualization inside a de facto state, Abkhazia. Abkhazia stands out among other post-Soviet de facto states: Abkhaz ethnic identity and the history of Abkhazian statehood extend back centuries. 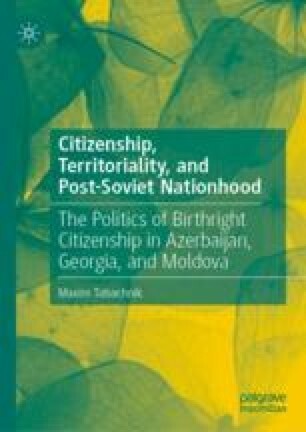 The case study of the concept of national identity and citizenship politics in the republic from the point of view of ethnic/territorial relationship and from the historical perspective is able to provide a unique insight into the concept of national identity in Georgia as well (namely its historical exceptionalism) and the crucial role of history in national identity and politics in the Caucasus and the PSS in general. Finally, the story of enfranchisement and disenfranchisement of Abkhazia’s own minority group, Mingrelians/Georgians of the Gal region, brings another testimony of the victims of citizenship politics and the tension between ethnic and territorial concepts of nation in the former USSR, where ethnic enclaves abound. Kvarchelia, Liana. 2014. Abkhazia: Issues of Citizenship and Security. Centre for Humanitarian Programmes. http://www.saferworld.org.uk/resources/view-resource/807-abkhazia-issues-of-citizenship-and-security. Siddi, Marco. 2012. A Short History of the Georgian-Abkhaz Conflict from Its Origins to the 2008 War. Reflections on Abkhazia. http://www.reflectionsonabkhazia.net/index.php/marco-siddi, accessed October 30, 2016. Юнгe, Mapк, Дaниeль Mюллep, Boльфгaнг Фoйepштaйн, and Ивaн Джyxa. 2015. Этнoc и Teppop. In Бoльшeвиcтcкий Пopядoк в Гpyзии. Бoльшoй Teppop в Maлeнькoй Кaвкaзcкoй Pecпyбликe. Mapк Юнгe and Бepндт Бoнвeч, eds. P. 208. Moscow: Deutsches Histrorisches Institut. http://www.hamlet.ru/?id=26983&view=item, accessed December 4, 2016.